When talking about using your computer for making slide-show presentations, you can't find a screen bigger than the Web. In it's ability to reach viewers for your presentation, the Web is unrivaled  limited only by the number of connections your Web server can handle. All four of the major presentation packages  Microsoft's PowerPoint, Corel's Presentations, StarOffice's Impress and Lotus' Freelance.programs  include filters for saving your files as HTML (Web) pages, allowing you to put them on the Web. Using Java and plug-ins to handle the animations and other special effects (fading from one frame to the next, having text slide onto a page or fade in), these programs allow you to put your presentations online in much the same format as they appear in their native environment. PowerPoint 2000 is the current Windows version, and includes the latest Web-translation filters for turning your PowerPoint slide shows into Web pages. Unlike Microsoft's PowerPoint, Presentations is not available as a standalone program  you can only get it as part of Corel's WordPerfect Office 2000 suite. Then again, as a standalone, PowerPoint 2000 runs $339, while the WordPerfect Office Standard Edition, which includes Presentations 9, is only $299  which also gets you WordPerfect 9, the Quattro Pro 9 spreadsheet and the Trellix HTML editor. Also unlike PowerPoint, Presentations is available for Linux as part of the WordPerfect Office 2000 suite for Linux  which is only $99 and includes Corel's Linux OS. Corel seems to be the only one of these companies whose site includes links to folks who have used their slide show program to create online pages. I also created a little (one-page) test slide show in Presentations, and saved it to my Web site. By going to my site, you can get the Presentations Show It! plug-in for either Netscape or Explorer and see the kind of animations you can bring to your own slide shows. When it comes to presentation software, you can't beat the price of Sun's Impress presentations package in its StarOffice suite: The entire suite is free for the downloading. Mind you, it's big  close on 100 megs, so unless you have a T-1, DSL or cable, you will probably want to purchase the CD-ROM version for $39.95. 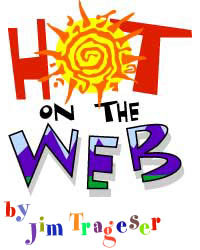 When exporting to the Web, Impress uses Active Server and Perl scripts rather than Java, but its Web site (above) claims to achieve animation just as smooth as what Corel and Microsoft offer. StarOffice is available for Windows, Linux and Solaris (both Sparc and Intel).